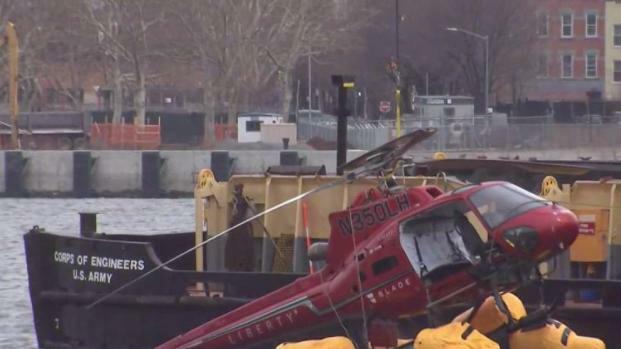 All five passengers killed when their tour helicopter sputtered and plunged into the East River, marking one of the deadliest civilian aviation crashes in the city's history, died of drowning, officials said. Marc Santia reports. 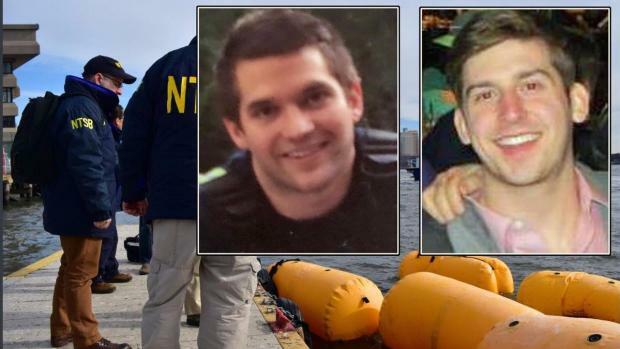 Investigators recovered a flight data recorder and a GoPro camera Tuesday as they tried to determine the cause of a deadly helicopter crash in the East River and figure out whether passengers' harnesses hindered their escape from the sinking aircraft. Tuesday's revelation comes as medical examiners revealed that all five passengers who perished after the helicopter crashed into the East River Sunday evening drowned, and as the Federal Aviation Administration revealed it was giving "urgent attention" to the use of harnesses in aerial photography flights. 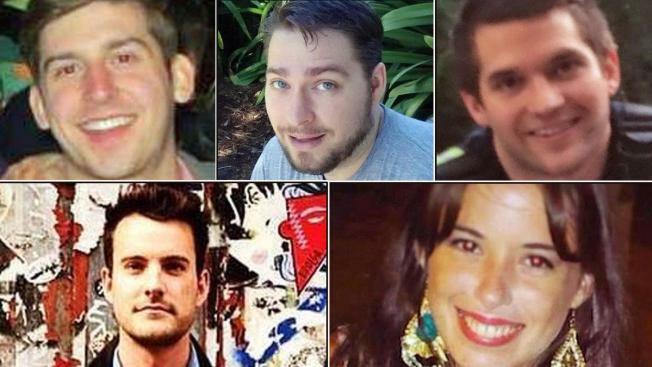 Also Tuesday, the first lawsuit following the crash that killed 29-year-old Carla Vallejos Blanco, an Argentinian tourist, longtime 26-year-old friends Brian McDaniel, a Dallas firefighter, and Trevor Cadigan, whom McDaniel was visiting, and two helicopter employees -- 29-year-old Tristan Hill, 34-year-old Daniel Thompson was filed against Liberty Helicopters and others. The suit, filed by Trevor Cadigan's family, seeks unspecified damages and spotlights the harnesses used in the open-door flight and notes the aircraft's inflatable floats didn't keep it from flipping over and sinking. The way passengers were harnessed, with a release mechanism in the back, there "was just no prospect of safely escaping," said Gary C. Robb, a lawyer for the parents of 26-year-old Trevor Cadigan. A flight data recorder and camera are being analyzed, but the focus is on the harnesses the passengers were wearing. Michael George reports. Liberty Helicopters hasn't responded to requests for comment and referred all inquiries to federal authorities. The pilot, identified by sources as 33-year-old Richard Vance, called "Mayday!" in a distress call several times and reported the chopper had experienced engine failure right before the crash. Witnesses reported seeing it hovering over the river, then suddenly descend, its propellers madly spraying water. The chopper then overturned and submerged, trapping the five passengers inside. A cause of the crash remains under investigation, but a senior law enforcement official told News 4 Monday that Vance speculated in an initial interview it was possible one of the passengers inadvertently hit the fuel cut-off switch with a piece of equipment, which may have caused the engine to fail. The National Transportation Safety Board, which is leading the investigation, said it would look at the switch, the chopper's flotation devices and the photos on passengers' cameras to figure out what caused Sunday's deadly plunge. NTSB member Bella Dinh-Zarr said the agency hasn't spoken yet to the pilot but hopes to do so. The chopper was owned by Liberty Helicopter Tours, which said Monday in a statement, ""We are focused on supporting the families affected by this tragic accident and on fully cooperating with the FAA and NTSB investigations. These agencies have asked us to respect the investigative process by referring all press inquiries to them for any further comment." Meanwhile, friends, family members and those who knew the victims voiced prayers and support, along with fond remembrances as the probe continued. Cadigan, 26, graduated from Southern Methodist University in 2016 with a bachelor's in journalism. He was an intern at Business Insider until a few weeks ago, the company said, adding it was devastated to hear of his death. "He was a smart, talented, and ambitious young journalist and producer who was well-liked and made a big contribution," Business Insider said in a statement. "Our hearts go out to his family and friends." McDaniel, whose body was returned to Dallas on Tuesday, is survived by his parents and older brother. "Officer McDaniel was single, and had no children, but was immediately survived by his Father, of Dallas; and his Mother and older Brother, of Denver, CO," the Dallas Fire-Rescue said in a statement. "Despite his short tenure, hearts are heavy with grief as we not only try to come to grips with his loss departmentally; but to also be there in every way that we can for his family. The family asks for privacy during this trying time." Hill, 29 and engaged to be married, was most recently working at a sightseeing tour company but had previously been a basketball operations assistant with the Westchester Knicks, a Development League affiliate of the New York Knicks. Two of the five passengers killed when their tour helicopter plunged into the East River Sunday, marking one of the deadliest civilian aviation crashes in New York City history and one of the worst in America in the last few years, are high school friends who were doing sightseeing in the city this past weekend. Rana Novini reports. He "brightened every room he entered, with a contagious smile and an unparalleled enthusiasm for life," the team said in a statement.